Finding the right lighting for a workspace can be a challenge. Whether you are lighting an office or a factory, it is important to choose lights that help you work comfortably and effectively while also providing value. LED lighting has proven to be more energy efficient than fluorescent or incandescent lighting, but is often derided as harsh. Traditional LED fixtures can also be difficult to install and maintain in certain spaces because of their thickness. We have a solution here at Horner. Our white LED flat panel troffers address all the problems that usually cause people to shy away from LED lighting options. The light source in our troffers has been reoriented to provide appealing, evenly-distributed, bright light. With our troffers, you will swear you’ve installed skylights. Of course, these white LEDs are so much more than aesthetically pleasing. As our customers have come to expect, we have designed these LEDs to give you the best value in terms of energy efficiency and lifetime costs. Our troffers only use 40 watts, and can last over 80,000 hours at L70. Over time, these fixtures will help you save electricity and cut down your maintenance and replacement costs dramatically. What’s more, our troffers are easy to install and replace, even in the tightest of spaces. This is because they are a fraction of the thickness of other troffers. The thin, lightweight extruded aluminum construction of our panels makes them much easier to handle and install than competitors’ flat panel lighting fixtures. They’re made to fit easily into a grid-style ceiling in office buildings or to hang from chains in more industrial settings, and replacement only takes a few seconds. 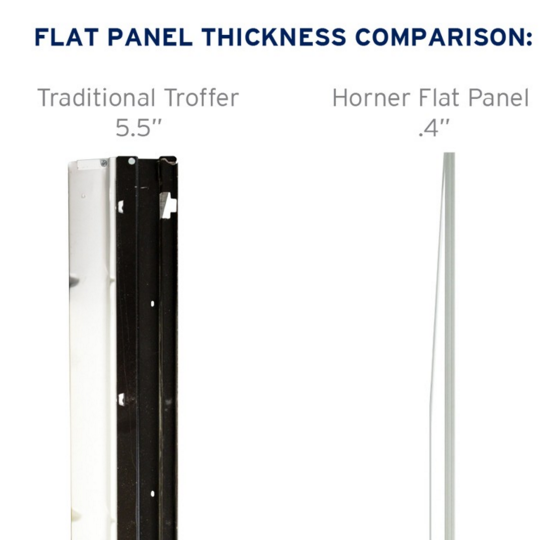 In addition to the ease of installation, our troffers are made with control in mind. They are designed to be easily connected to wired lighting controllers, like our new ETG-CSHOP-1. These troffers offer control, convenience, style, and value — all backed by a 5-year warranty. Our white LED flat panel troffers are an investment in long-term quality and value, sure to provide a pleasant and productive workspace. Contact us for pricing and more information.